Rep. Jim Walsh, in a dramatic break with the White House, returned Monday from a trip to Iraq saying it's time to bring troops home and stop funding the war. The moderate Republican from Onondaga representing New York's 25th Congressional District has struggled for months with conflicting emotions about the war. "Before I went, I was not prepared to say it's time to start bringing our troops home," Walsh said. "I am prepared to say that now. It's time." Walsh's announcement came as Gen. David Petraeus, the U.S. commander in Iraq, told House members that the troop "surge" has made progress. But Walsh said he saw little evidence that much has changed in Iraq since he last visited four years ago. He said he hopes to meet with President Bush to convey his change of heart. Congressman James Walsh of New York served as a Peace Corps Volunteer in Nepal in the 1960's. Read more. It goes back a long time. When I was just finishing up my college, I applied for the Peace Corps, and I was accepted in an agriculture program, which surprised me because I had very little practical agriculture experience. I was sent to Nepal. I lived in Nijgarh, Bara. Our district capital was Kalaiya. We had a dera in Birgunj that we shared with four-five of my Peace Corps friends. When we went to the district krishi bikas meeting, we would stay in the dera, and would take the bus back and forth to Kalaiya. It was a very bumpy ride. I worked with farmers in Nijgargh Pachayat. I worked with people who moved down from hills and people who were indigenous in the terai-- the tharus. I grew wheat, corn, rice vegetables. I did a little bit of everything. I was able to see a lot of Nepal while I was there. I traveled to the West: Pokhara and Annapurna, and to Namche and the Everest region. I try to, as best I could, maintain my ties with friends whom I lived with. I email back and forth. I obviously follow the politics and the recent changes in Nepal. My hope is that I could go and observe the elections. That would be ideal. I think the elections are the critical event in the near term history of Nepal. But when I first came back here in 1991, and the government changed and democracy was established, we wrote to the king, and asked the king to respect the students and people who went to streets asking for democracy. And I saw the impact that the United States had, and I think that the United States continues to play a positive role encouraging democracy. So if I could go for the election, that’s when I would go. Dherai namaskar and namaste to mero daju bhai, didi bahinii, and I miss Nepal, and I am looking forward to coming back. Read more. Read more about Congressman James Walsh. Read more about Peace Corps Nepal. Read more about RPCVs and Iraq. At age 88, World War II veteran and former diplomat Everett M. Woodman took the podium as guest speaker at the 2004 Fourth of July celebration in Hanover, N.H., and condemned the war in Iraq as a betrayal of American ideals. Some in the crowd booed the former Navy intelligence officer, who 60 years prior had stormed the beaches at Normandy and now stood with the help of two canes. But Mr. Woodman continued speaking, according to his daughter Betsy, of Andover, N.H., who was in the audience. "I think they expected a normal patriotic speech and he came out with this blistering stuff," she said. From 1952 to 1954, Dr. Woodman worked in Madras, India as a cultural affairs officer for the United States Information Agency, and for an interim as acting public affairs officer for South India. For the next four years he served as an attaché at the U.S. Embassy in New Delhi and as director of the Educational Exchange Program under the India-U.S.A. Agreement of Public Law 48. In 1958, Dr. Woodman joined the Ford Foundation as an educational consultant to the Government of India's Ministry of Education until his appointment as president of Colby Junior College in 1962. As president, Woodman led the college through ten years of growth and transformation. During his term, he emphasized the importance of an international perspective on education, as evidenced by campus events such as United Nations Day and Reaching the Questioning Mind Overseas. He also sought the opinions of the college's students, faculty, and alumnae and cultivated a strong relationship with them. 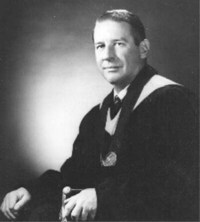 Dr. Woodman served as president of the American Association of Junior Colleges from 1969 to 1970 and was also active in the New Hampshire Council on World Affairs. After leaving Colby Junior College in 1972, Dr. Woodman served as president of the Nature Conservancy in Washington, D.C. Later he was appointed director of the Peace Corps in Morocco. Colby-Sawyer College presented him with an honorary Doctorate of Humane Letters in May of 1995. Read more. I am glad that we are not closing this event with a bugle sounding taps, for it is not a military funeral. It is our celebration of freedom - our pledge to be worthy. And while a holiday is all around us, this gathering on the green is not a high-five conqueror’s party. We gather in justifiable pride, knowing likewise that we have as much to mourn as to memorialize. We weep for those we have lost, and combat veterans will best understand that kind of loss, for they had loved each other in that bond of danger and death. 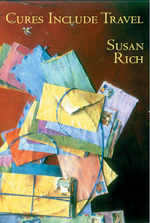 Permit me now to pursue that theme - quietly - because the subject is delicate, and I am sensitive to that. I am glad that Saddam Hussein is no more a worry. He was brutal and good riddance - but to get rid of him we betrayed our ideals and sold our soul to the totally un-American concept of “preemptive attack deterrence” - the most transparent rationalization of Pentagon double talk and in that unprovoked invasion and occupation of a sovereign nation we forfeited our claim to the moral high ground. There is no need to multiply illustrations of why much of America is now recognizing that the Iraq adventure was a colossal tragic mistake – and when history fully appraises this worst military and diplomatic blunder in memory it will portray properly a man so hungry to be a war time President that he could taste it. “Bring ‘em on” he said. It will also reveal how every episode of this dreadful undertaking , from the constantly concealed civilian death toll, to American torture of prisoners, to the hastily arranged secret and superficial ceremony conveying “full sovereign authority” to Iraq, how every aspect of this long charade has been slanted and sold by shameless rationalizations – semi-plausible sounding reasons for doing what should never be done, and not doing what should be. Now we look ahead and our prayer is that our young people and their children will develop the courage and wisdom to find victorious living in ways other than war - that their lives in a contracting world will eliminate fear of cultural differences - the mindless prejudice that often twists proper patriotism into negative nasty nationalism that turns otherwise civil societies into warring tribes. Teach our children to have faith in humanity and to know the dignity of all human beings. Reaffirm America’s basic belief that all people are created equal - that we all are children of the Universe. There is no nonsense about that - it is universally obvious and fundamentally American. Read more. Read more about Peace Corps Morocco. Read more about Peace Corps Country Directors. In war, sometimes it’s important to pick the right adversary, and in Iraq we seem to have done so. A major factor in the sudden change in American fortunes has been the outpouring of popular animus against Al Qaeda and other Salafist groups, as well as (to a lesser extent) against Moktada al-Sadr’s Mahdi Army. These groups have tried to impose Shariah law, brutalized average Iraqis to keep them in line, killed important local leaders and seized young women to marry off to their loyalists. The result has been that in the last six months Iraqis have begun to turn on the extremists and turn to the Americans for security and help. The most important and best-known example of this is in Anbar Province, which in less than six months has gone from the worst part of Iraq to the best (outside the Kurdish areas). Today the Sunni sheiks there are close to crippling Al Qaeda and its Salafist allies. Just a few months ago, American marines were fighting for every yard of Ramadi; last week we strolled down its streets without body armor. But for now, things look much better than before. American advisers told us that many of the corrupt and sectarian Iraqi commanders who once infested the force have been removed. The American high command assesses that more than three-quarters of the Iraqi Army battalion commanders in Baghdad are now reliable partners (at least for as long as American forces remain in Iraq). In addition, far more Iraqi units are well integrated in terms of ethnicity and religion. The Iraqi Army’s highly effective Third Infantry Division started out as overwhelmingly Kurdish in 2005. Today, it is 45 percent Shiite, 28 percent Kurdish, and 27 percent Sunni Arab. In the past, few Iraqi units could do more than provide a few “jundis” (soldiers) to put a thin Iraqi face on largely American operations. Today, in only a few sectors did we find American commanders complaining that their Iraqi formations were useless — something that was the rule, not the exception, on a previous trip to Iraq in late 2005. Michael O'Hanlon, a Senior Fellow at the Brookings Institute and a Visiting Lecturer at Princeton University, served as a Peace Corps Volunteer in Congo Kinshasa. Read more. In 1975, Army Col. Harry Summers went to Hanoi as chief of the U.S. delegation's negotiation team for the four-party military talks that followed the collapse of the South Vietnamese government. While there, he spent some time chatting with his North Vietnamese counterpart, Col. Tu, an old soldier who had fought against the United States and lived to tell his tale. With a tinge of bitterness about the war's outcome, Summers told Tu, "You know, you never defeated us on the battlefield." Tu replied, in a phrase that perfectly captured the American misunderstanding of the Vietnam War, "That may be so, but it is also irrelevant." Today, in Iraq, we face a similar conundrum. Our vaunted military has won every battle against insurgents and militias—from the march up to the "thunder runs" that took Baghdad; the assaults on Fallujah to the battles for Sadr City. And yet we still find ourselves stuck in the sands of Mesopotamia. In a New York Times op-ed published Monday, Brookings Institution scholars Michael O'Hanlon and Kenneth Pollack argue that "[w]e are finally getting somewhere in Iraq, at least in military terms." They go on to describe the myriad ways the surge is succeeding on the security front. But in emphasizing this aspect of current operations, they downplay the more critical questions relating to political progress and the ability of Iraq's national government to actually govern. Security is not an end in itself. It is just one component, albeit an important one, of a comprehensive counterinsurgency strategy. Unless it is paired with a successful political strategy that consolidates military gains and translates increased security into support from the Iraqi people, these security improvements will, over time, be irrelevant. O'Hanlon and Pollack report progress from several diverse Iraqi cities, including Sunni-dominated Ramadi, Arab-Kurdish-Turkman Tal Afar and Mosul, and Shiite-Sunni Baghdad. Curiously, the scholars' dispatch ignores Baqubah, Samarra, Kirkuk, and the areas south of Baghdad—places with the highest sectarian tensions, worst fighting, and least progress. The short, selective itinerary raises questions about who planned the trip, whom O'Hanlon and Pollack were able to talk with, and what they actually saw—as opposed to what they were briefed on during visits to U.S. bases. At best, these two men saw enough of Iraq to get a glimpse of reality there. At worst, they saw a Potemkin Village of success stories, not unlike the picture shown to visiting congressional delegations, that left them with a false vision of progress. Read more. Read more about RPCV Michael O'Hanlon. Although senior Iraqi officials have strongly opposed a partition and the Bush administration has no interest in it, O'Hanlon claims that it's already occurring. "It is what's happening on the ground. Iraq is being torn apart; Iraq is being divided along sectarian lines whether most Iraqis want it or not. Al-Qaida strategy in that regard has been working," he said. "Iraq is being ethnically segregated. Ethnic cleansing is on its way, it's happening, and at least a couple million people have been displaced. It's becoming Bosnia in some ways. "We would rather manage the process than have the death squads and the militias do the separation for us," O'Hanlon said. "The United States cannot impose partition for Iraq. Only Iraqis can decide this," Joseph said. "Iraqis have already agreed to an extent. The constitution already contains the fundamental vision for a soft partition." 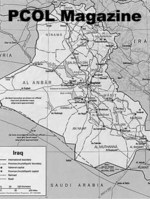 The plan would call for American troops to stay in Iraq for 12 to 18 months in order to help protect Iraqis relocating to their own sect's region. Although such a move would be voluntary, Joseph said the pressure of being a minority in a hostile neighborhood would eventually sway those who decide not to move. Regional boundaries would have to be drawn, with outside help, to mediate any arguments over territory. Those who would have to be uprooted, estimated at 5 million by O'Hanlon and Joseph, would then have to be given assistance in building a new life. That would be done through a house-swapping scheme and a job-creation program, which should create 3 million jobs paying roughly $1,000 a year. Republican Congressman Tom Petri voted for the resolution which expressed disapproval of President Bush's troop surge in Iraq, but he said that "Just saying 'no' is simple obstructionism. What we need is a new way forward to replace the old way that isn't getting us anywhere. " He said that the different groups in Iraq lack the trust in each other to support democratic government in a unified nation. "We should seriously consider that we have two basic options: First, choose a faction to stabilize and rule the country through force, much as all of Iraq's previous regimes did - and that's hardly an attractive option; or, second, bring about a partition of the country to form a loose federation where the Shias, the Sunnis and the Kurds can each govern themselves while leaving the others alone," Petri said. "Our enterprise in Iraq has been carried out with the best of intentions, and our men and women in the armed forces have performed with great heroism, skill and honor - but we have to accept reality," he said. "We have a responsibility to help stabilize the situation, and doing so is in our national interest. But I don't think it's fair to ask our sons and daughters to be policemen in a civil war. Sadly, it seems that most Iraqis do not embrace democratic government unless it is dominated exclusively by their own individual groups. The Sunni, the Shia and the Kurds are willing and able to establish law and order within their own ethnically homogeneous areas. The efforts to push out other groups currently underway in Iraq are deplorable, but it's surely not unexpected given Iraq's history and desperate situation. The sectarian militias have popular support because they have easily-understood plans to establish security within their spheres for their own people. Instead of fighting the militias, we need to co-opt them. We need to help acceptable local tribal leaders, government leaders and religious authorities establish authority over their areas. We also need to seek the positive involvement of Iraq's neighbors. Some of them may be meddling, or may be tempted to meddle, but at the end of the day, instability in Iraq means instability for everybody in the region. Let us set about the task of helping Iraq's three main groups to regroup and stabilize their own territories so that we can withdraw to our bases and ultimately get out altogether." Read more. Rep. Tom Petri has joined a small but growing number of Republican lawmakers who have broken ranks with the Bush administration by showing disapproval to escalate troop levels in Iraq. Petri’s announcement in a floor speech came with the caveat that he didn’t think the nonbonding House resolution addresses the need for a new policy. Petri suggested the United States should support the partition of the country into a confederation of regions each dominated by Shiites, Sunnis or Kurds who "can each govern themselves while leaving the others alone." Congressman Tom Petri of Wisconsin served as a Peace Corps Volunteer in Somalia in the 1960's. Read more about Congressman Thomas Petri. Ben Bell would rather see peace than war and rather see money going to the Gulf Coast than to Iraq. Bell is one of many activists traveling to a march in Washington to call on Congress to end the war in Iraq. 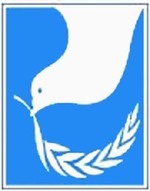 The march is being organized by United for Peace and Justice, a coalition of over 1,000 groups that includes the Buddhist Peace Fellowship that Bell works with. The rally is an interfaith event that will bring together Buddhist groups as well organizations representing Baptists, Lutherans and Catholics. Bell, a practicing Buddhist, said he's looking forward to joining with people of different beliefs for this common cause. "It's terrific that everyone can come together and show how they feel about this unjust war," he said. "A call for peace is needed from everyone." That call for peace is one that Bell has dedicated his life to answering since 2003. That's when he got involved with the Montgomery Peace Project, a local anti-war activist organization. Bell was involved in a peaceful vigil the organization put together in March 2003 at the State Capitol. 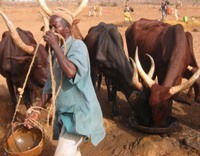 Bell served as a Peace Corps Volunteer in the African country of Zambia. "I was living like (Henry David) Thoreau with no running water or other amenities," he said. There, Bell began to study Buddhism and was moved by the message for peace that he found in that philosophy. He was especially moved by the Four Noble Truths of Buddhism: life is suffering, the origin of suffering is attachment, the cessation of suffering is attainable and there is a path to the cessation of suffering. "I think the Buddhist nature exists in everyone," he said. Read more. Caption: August 29, 2004 - New York and America Say No to Bush: In a march that stretched for miles and went on for hours New Yorkers and Americans said no to Bush. Farr says he knows the president will never sign his bill, but he hopes his initiative will stir a public debate and give those who have voted to support the war in the past an opportunity to register their objections now. "This gives them a chance now to say, 'OK, you don't have it anymore. Mr. President, I'm repealing that authority'," Farr said. Farr said Bush's call for escalation was a "tipping point" for him after three years of opposing the war and the deaths of at least six constituents in Iraq. Most surprising in Bush's announcement, Farr said, was that U.S. troops will now attempt to prevent Iran from moving arms and people into Iraq. "What does that mean?" said Farr, explaining that he's concerned that the troop escalation may signal invasions of other Middle Eastern countries, particularly Iran and Syria. Farr, who is a member of the Out of Iraq Caucus, said his bill is one of several expected to be unveiled by other caucus members following President Bush's speech on January 10. Farr said his bill will now move into the House's Armed Service Committee and likely will be up for discussion in the full House in a couple of weeks. "Meanwhile," he said, "I will be getting co-sponsors." Congressman Sam Farr of California served as a Peace Corps Volunteer in Colombia in the 1960's. Read more about RPCV Sam Farr. The time for blunt force is long past. Instead, we ought to withdraw our combat troops from urban centers of sectarian conflict, where they are simply cannon fodder. We ought to focus on training reliable Iraqi security forces whose allegiance is to the greater Iraqi people, not to any specific sect. We need to redouble counterterrorism efforts and border security to deny al-Qaeda a failed-state foothold. And, perhaps most importantly, we must engage Iraq’s leaders and its neighbors to promote political reconciliation. If the only solution to Iraq a is political one, diplomacy is the only weapon we have left. What has the administration been doing in the last four weeks? 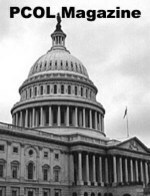 Since the time the Iraq Study Group’s report was released, almost 100 American soldiers have been killed and by many estimates, four to five thousand Iraqi civilians have been killed in the widening strife.And the President’s solution to all of this was to ignore the most important recommendations of the Iraq Study Group – namely “robust diplomacy,” and instead settle on an escalation of our current combat strategy. This is a tactic in search of a strategy, and it will not bring us a stable Iraq. 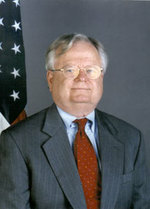 Senator Dodd served as a Peace Corps Volunteer in the Dominican Republic in the 1960's. Read more stories about Senator Dodd. Caption: Senate Dodd at the at Senate Foreign Relations Committee Hearing with Senators Kerry and Biden. However mediocre its prospects, each main element of the president's plan has some logic behind it. On the military surge itself, critics of the administration's Iraq policy have consistently argued that the United States never deployed enough soldiers and Marines to Iraq. Now Bush has essentially conceded his critics' points. To be sure, adding 21,500 American troops (and having them conduct classic counterinsurgency operations) is not a huge change and may be too late. But it would still be counterintuitive for the president's critics to prevent him from carrying out the very policy they have collectively recommended. Rather than deny funding for Bush's initiatives, Congress should provide it now -- but only for fiscal 2007 (meaning through September). By that point, or even the August congressional recess, we should know if the surge is showing promise. If it does, Congress could consider continuing its support. If not, the moment will be right to force the president's hand and move to a backup plan. If the surge fails, we will need a whole new paradigm for Iraq policy, and it is hardly too soon for Congress to start fleshing out our choices. But for now, Congress should also give the president the money and support that he requests. 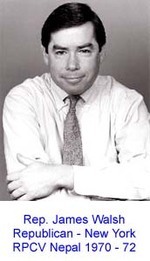 Michael O'Hanlon, a Senior Fellow at the Brookings Institute and a Visiting Lecturer at Princeton University, served as a Peace Corps Volunteer in Congo Kinshasa. Read more by Michael O'Hanlon. "I learned about the courage of conviction last week when I met with a courageous young American patriot. A leader who lives by example. An individual, who out of a decision of moral conscience, refuses to participate in a war that he believes (after much personal research) violates the U.S. Constitution, Geneva accords, Nuremberg principals, and the United Nations Charter. First Lieutenant Ehren Watada, a 28 year old U.S. Army artillery officer from Hawaii, has become the first active duty military officer publicly to oppose the war in Iraq. As a result of his act of conscience and challenging what we now know about the war in Iraq, Lt. Watada is facing military court martial at Ft. Lewis Washington this February 5, 2007." "I, for one, am outraged. If the past national election or national polls are any indication of America’s dissatisfaction and outrage with the Iraq war then I am in good company. Seventy-two percent of the U.S. troops in a 2006 Zogby poll want the U.S. out Iraq in 12 months. So when an individual emerges with the integrity of Lt. Watada, all of us benefit, whether we agree with him or not. In the national debate on the Iraq war we have an island boy risking all that he has including his future to help us all arrive at the truth." Read more and leave your comments. "I feel that we have been lied to and betrayed by this administration," Watada said in a telephone interview from Fort Lewis. "It is the duty, the obligation of every soldier, and specifically the officers, to evaluate the legality, the truth behind every order — including the order to go to war." 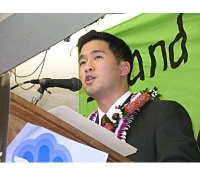 His father — Robert Watada, a retired Hawaii state official — was opposed to the war in Vietnam, and was able to do alternative service in the Peace Corps in Peru. In making his decision, Watada has reached out to peace groups, including clergy, students, some veterans opposed to Iraq and others. Some war critics are raising money for his legal defense as they seek to galvanize broader opposition to Bush administration policy in Iraq. Read more and leave your comments. 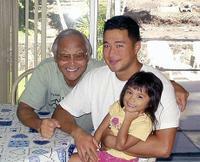 Caption: Lt. Ehren Watada, center, with his niece Kodie Watada and his father, Robert, who opposed the Vietnam War and served as a Peace Corps Volunteer in Peru. "After spending six days in the Middle East last week - which included visits with the top leaders in Iraq, Lebanon, Syria, Jordan and Israel - it's hard not to come to the same conclusion: Our strategy in Iraq makes no sense. It never really did. It is as bad in person as it appears on television. There are literally dozens of sects, militias, gangs, warlords, foreign terrorists and others killing one another for dozens of reasons in Iraq today, and American troops are caught in the crossfire. Our brave men and women have done everything asked of them with great courage and honor, but searching for military solutions in Iraq today is a fool's errand. True peace and security in Iraq will not come at the end of an American gun. It will only happen to the degree that Iraq's leaders are willing to take responsibility for governing their own country and securing their own future. America's position should be clear: Iraqis must show they want a country now, or American troops should begin to withdraw." Senator Chris Dodd of Connecticut served as a Peace Corps Volunteer in the Dominican Republic in the 1960's. He is considering a run for Presidency in 2008. This editorial first appeared in the Des Moines Register. Read more and leave your comments. 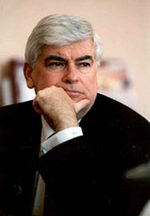 Senator Chris Dodd of Connecticut served as a Peace Corps Volunteer in the Dominican Republic in the 1960's. Sam Farr calls the findings of the Iraq Study Group "honest" and "realistic"
"Honest, realistic assessments like incoming Defense Secretary Bob Gates yesterday admitting that 'we're not winning' in Iraq, and the bipartisan Iraq Study Group today highlighting that the situation is 'grave and deteriorating' have been missing and ignored in Republican-run Washington for the last three years," Farr said. 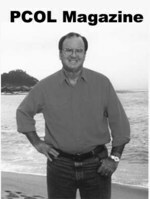 Congressman Sam Farr of California served as a Peace Corps Volunteer in Colombia in the 1960's. 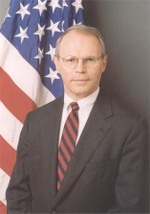 Congressman Chris Shays of Connecticut served as a Peace Corps Volunteer in Fiji in the 1960's. Rep. Tom Petri says the newly-released high-level Iraq Study Group report is "a pretty sobering document"
"One thing that impressed me as I was reading through it was the answer to the question, 'What happens if they establish these benchmarks, and they don't, in fact, help make real progress toward achieving security so that we can withdraw our troops and redeploy them," Petri said. "And the answer in the report is if they don't do that, the United States should keep open the option to reduce its political, military or economic support for the Iraqi government, which to me means that they are keeping open the option of maybe finding a stronger government that can deliver over in that part of the world." Congressman Tom Petri of Wisconsin served as a Peace Corps Volunteer in Somalia in the 1960's. "The simplest conclusion to reach is that Iraq, now one of the two or three most violent places on Earth, is in civil war but not yet all-out absolute civil war. Does it matter? Politically, here at home, I believe Americans care less about semantics and more about whether they sense we have a credible strategy for victory — or at least for achieving some measure of stability in Iraq. (Research from various scholars, including Duke University professor Peter Feaver who now works for President Bush, backs up this generalization about what most determines American public support for the nation's wars.) I think the answer is that clearly Americans do not believe we are winning. They do not believe we presently have a strategy that will change the trajectory in Iraq. In other words, we already knew we were losing, whether one called this a civil war or not. The important question is can we turn things around, not whether we can find some way to spin events in Iraq into a more positive picture than the facts warrant. But let's call a spade a spade: Right now we are part of a losing operation, and Iraq is in a civil war. What is more, American voters know it — meaning that 2007 will probably be make or break time for this country's willingness to continue the war effort." 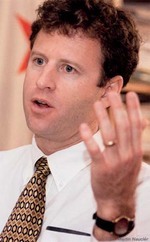 Michael O'Hanlon, a Senior Fellow at the Brookings Institute and a Visiting Lecturer at Princeton University, served as a Peace Corps Volunteer in Congo Kinshasa.